Since I am a search consultant, I was very happy to see that “Search” as a topic made it even to the main keynote of Microsoft Ignite. It was great seeing the enhancements added to “Modern Search” in Office 365 – however I have missed something. Watch Satya Nadella’s Vision Keynote HERE. Then “the” Search session Monday afternoon (a few hours after Satya Nadella’s keynote) made everything clear. The session was titled “Accelerate productivity with search and discovery in SharePoint and Office 365” by Naomi Moneypenny, Senior Product Manager and Kathrine Hammervold, Principal Program Manager. Search in Windows: While I don’t believe Bing for Business will transform everyone using Bing as the primary search engine, there is a feature that makes much more sense imho. When a user uses search in Windows, it will provide results coming from Office 365 and OneDrive for Business soon – driven by Microsoft Graph, of course. Keywords are: personalized and behavior based search. Everything is “personalized“. Everything is “behavior based“. The goal is to “delvify” everything. As you can see, the most important thing behind all of these announcements is Microsoft Graph. Microsoft says no less than Office 365 has “the first personalized enterprise search engine in the industry“. Watch the Search session of Naomi Moneypenny and Kathrine Hammervold HERE. Or maybe you already have the same impression what I did have attending the first day of #MSIgnite: that everything is consumer-like. Everything is about relationships. Everything is getting “delvified”. But where is the content? Where is metadata?! Where is the effort many organizations put into their information architecture?! These are not reflected, and not even respected in this new, “modern” world. You cannot make any customization on the user interface. No custom metadata to be displayed. No custom filters. We don’t even have search refiners! Moreover, these are not even on the roadmap! This is very disappointing, isn’t it? After this confusing start of Microsoft Ignite, I had a session titled “Optimizing your Content for Search and Discovery“. But this would contradict everything I’ve been communicating over the past 10+ years. Long story short, I have introduced the Pyramid of Search and Content, which is a very simple way to give answers to all the questions and disappointment. The bottom layer of this pyramid is the unstructured content. No metadata, no structure, no governance – the typical “silo” that everyone knows. “Dark data” lives here which we don’t know too much, or in many cases we don’t know anything. In many cases, discovering content is the only chance to get ideas what we have here. And since there is no metadata, and no structure, we have to rely on our good old friend, “Everything” search. Which, as we all know, is very limited, and the relevance of results is always questionable. But, supposing that relationships stored in Microsoft Graph provide value and benefits, the modern search might really be a better option in this case. On the top of the pyramid, however, the content is very well structured. We have good metadata, too. – These are basic requirements for having good search applications. – But since there is no way to customize the “modern” search experiences in Office 365, the only thing we can rely on is the classic search. To improve and enhance Search, the goal is to move the content from the bottom towards the top of the pyramid, by adding more and better(!) metadata and structure. To conclude, I still believe that the new wave of “modern search” oversimplifies the real challenges of Enterprise Search. Most probably, this consumerization of the search experience does make sense when it comes to discover new content, or even when someone wants to find something in “everything”. But I still believe that search cannot be good enough without having good content. The goal should be to keep the customization options from “classic search” and add the “modern” benefits Microsoft Graph can provide. And not enforcing the organizations (and users!) to choose between these two. To watch my session at Microsoft Ignite 2017, click HERE. Search cannot be good enough without having good content. NextThe Psychology of Search – How Can Search Transform Negative Emotions into Positive? Thanks for sharing your thoughts about Ignite’s sessions. I did not note any discussions on data privacy when it comes to share sentitive information accross systems and countries via the unique search experience. Did you ? Also, I tried to view the video of the session of Naomi Moneypenny and Kathrine Hammervold and was relayed to a page not found. Can you help me/us about that ? Did any of the Ignite SharePoint Search discussions touch on the issue with Managed / Enterprise Metadata, large lists, and Search? We’ve noticed that with large lists, attempting to search for documents using Managed Properties (aliases as keywords) that are tied to Managed Metadata columns are throttled, even if they are indexed. Doesn’t matter how we build the lists, search results are not the same using the in-library search box versus the Managed Metadata Navigation web part. Does this become a training issue? Any idea if MS is going to solve this problem? I haven’t dig into this yet but put it on my task list. Will be back with a response as soon as I can! Your “Pyramid of Search and Content” is a great construct to use to think through the options available to us at this point in time. 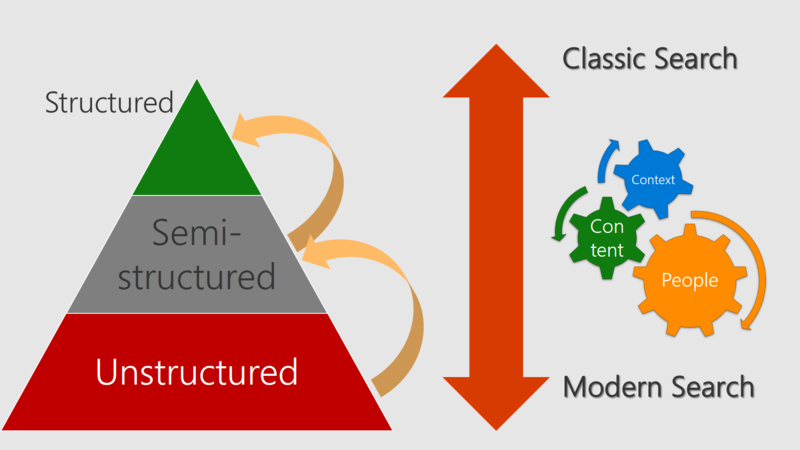 As with most of the “modern” experiences, Microsoft is “earning their way up the pyramid” in “modern” search. It’s my believe that they took their eye off the ball on metadata for a while, but now they are back on it. Things like the Attention View and smarter Filter Panes make that seem true to me. Plus, those are – in effect – simple search experiences, and some of the best kinds; the ones that get important work done.